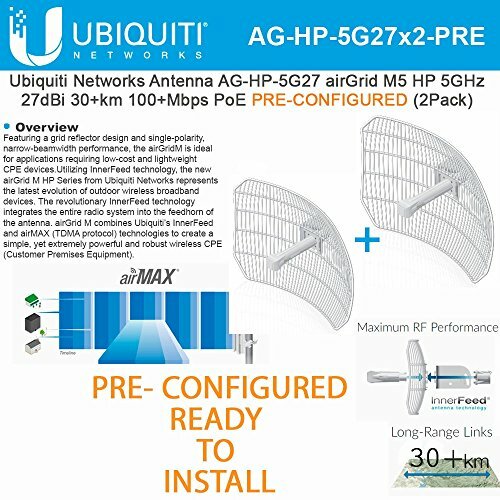 Ubiquiti 2-PACK airGrid M5 HP 27dBi AG-HP-5G27 Outdoor 5GHz 30+km 100+Mbps PoE - PRE-CONFIGURED/ READY TO INSTALL ** AG-HP-5G27 US is a Ubiquiti Networks airMAX CPE, and part of the airGrid line of products. It operates on 5GHz frequency with a 23dBi, ideal for PTMP applications. Breakthrough Wireless Performance, airMax and airControl Support 100+Mbps of real outdoor throughput and up to 30km+ range. airGrid products utilize Ubiquiti's revolutionary airMax TDMA protocol enabling scalable, carrier-class PtMP network performance. Additionally, airControl application allows operators to centrally manage 100's of devices. AG-HP-5G27 featuring a grid reflector design and single-polarity, narrow-beamwidth performance, the airGridM is ideal for applications requiring low-cost and lightweight CPE devices. Utilizing InnerFeed technology, the new airGrid M HP Series from Ubiquiti Networks represents the latest evolution of outdoor wireless broadband devices. airGrid M operates in the worldwide, license-free frequency range of either 2 GHz or 5 GHz, and features breakthrough performance of up to 100+ Mbps in real outdoor throughput and incredible range of up to 30+ km.